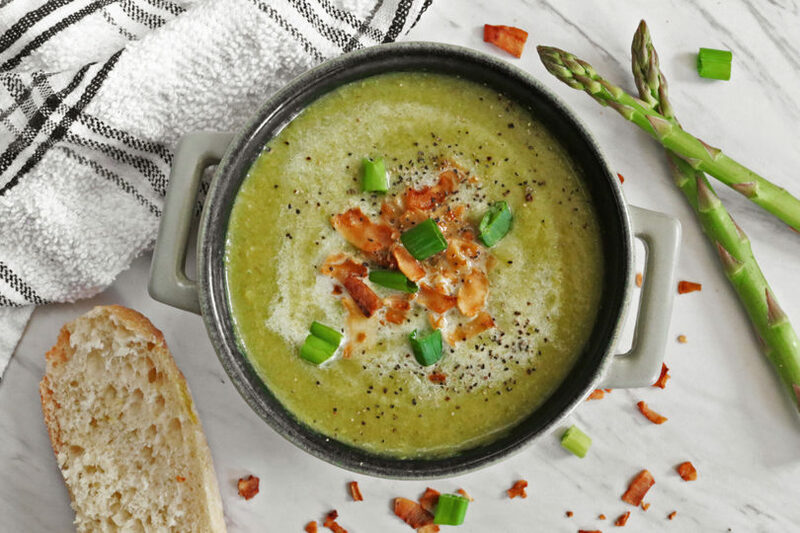 This vegan cream of asparagus soup recipe calls for zero dairy products, and yet, it has a wonderfully creamy consistency. It’s also extremely easy to make! When most people think of creamy soup, they usually imagine heavy cream, milk, and a lot of cheese. But when you eat a vegan diet, making homemade cream soup calls for some creativity and innovation. 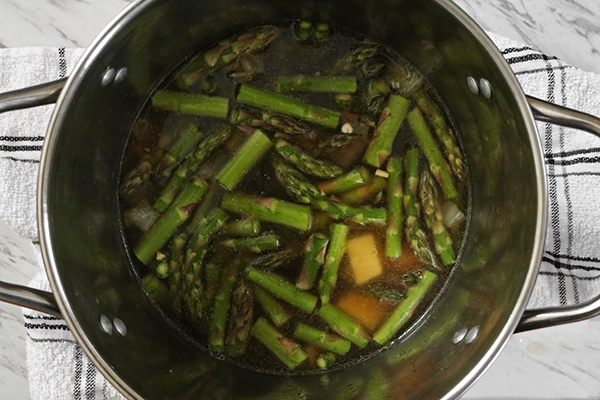 Take this vegan cream of asparagus soup, for example. This recipe calls for zero dairy products, and yet, it’s deliciously creamy. It’s also extremely easy to make! The key is to use potatoes. When boiled and pureed with other flavorful ingredients, potatoes create a wonderfully creamy consistency that’s hard to pass up. They’re also full of essential vitamins and minerals like vitamin B6, vitamin C, and potassium. Now, don’t get us wrong. We love making vegan cream soups with non-dairy products like milk, creamer, or sour cream. But when you want to switch things up or you’re all out of dairy-free milk, potatoes are an awesome choice. The asparagus is the real star of this recipe, though. It’s jam-packed with nutrients like vitamins A, C, E, K, along with calcium, protein, folate, iron, and fiber. And thanks to its bright green color, this tasty veggie makes for a beautiful springtime soup. 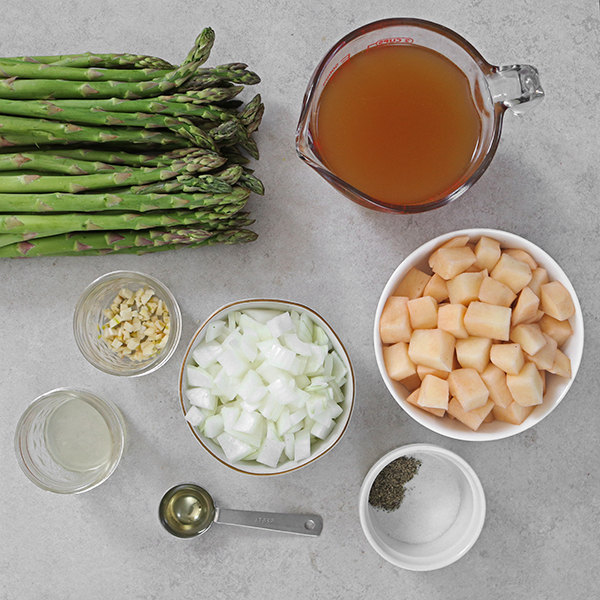 To make this vegan cream of asparagus soup, you’ll need two pounds of asparagus. 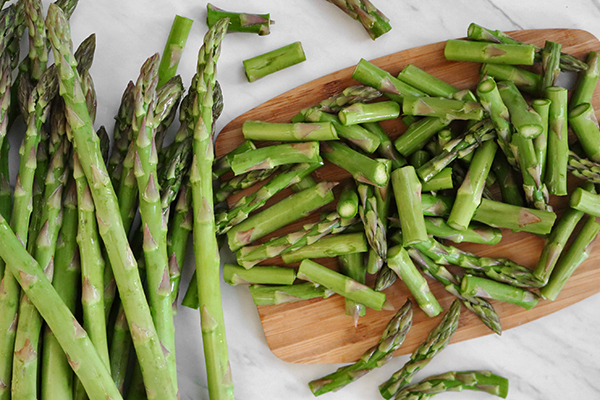 (Usually, one bunch of asparagus weighs about one pound.) You’ll also need olive oil, onion, potatoes, vegetable broth, minced garlic, lemon juice, salt, and pepper. The potatoes are key for making this soup super creamy. Trim the woody ends off the asparagus stems and cut into 1-inch pieces. In a large pot over low-medium heat, combine the olive oil and onions. Cook for 5 to 7 minutes or until the onions are clear. Add the garlic and cook for another 1 to 2 minutes. 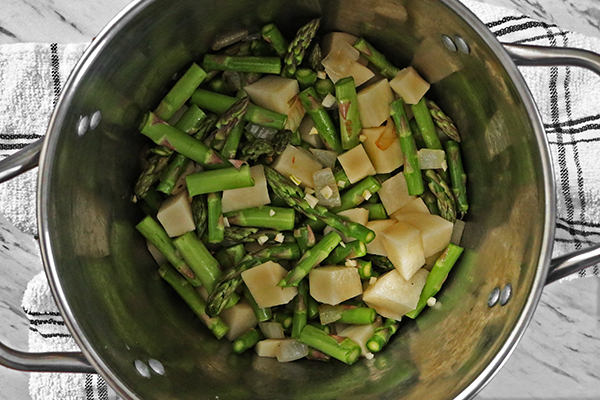 Add the asparagus and potatoes. Cook for 5 to 7 minutes, occasionally tossing. Add the vegetable broth, lemon juice, salt, and pepper. Bring to a boil, then reduce to a simmer, stirring occasionally. Cook for 25 to 30 minutes or until the vegetables are tender. Turn off the heat and let the mixture cool slightly. Finally, with a high-powered blender or food processor, blend everything together until creamy and combined. Give it a taste and add more lemon juice, salt, and pepper if necessary. Don’t be afraid to add other ingredients like fresh herbs or spices as well. When it’s time to eat the soup, re-heat it on the stove top or in the microwave. Garnish with vegan bacon, scallions, dairy-free Parmesan, or a swirl of vegan creamer. 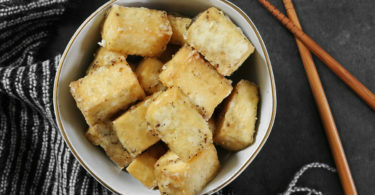 Serve with your favorite bread or croutons. And that’s all there is to it! Compared to boxed or canned soup, this vegan cream of asparagus soup is both simpler and healthier. After all, pre-packaged soup tends to be high in sodium and preservatives. By making your own soup, you can control all of the ingredients. It’s one of the best parts of cooking at home. 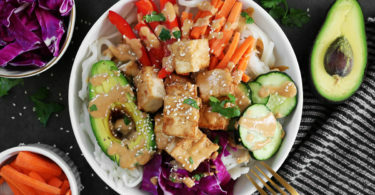 This recipe makes enough for about 8 servings. If you want to freeze it, simply pour the soup into an ice cube tray and pop it in the freezer. (This Extra-Large Freezing Tray by Souper Cubes is my personal favorite.) You can defrost the soup in the refrigerator overnight then gently re-heat it in a saucepan. Alternatively, you can microwave the soup in 2-minute increments before re-heating it on the stove top. Usually, freezing both dairy and non-dairy soups can make the ingredients separate. But since this vegan cream of asparagus soup is potato-based, you’ll be less likely to have this problem. 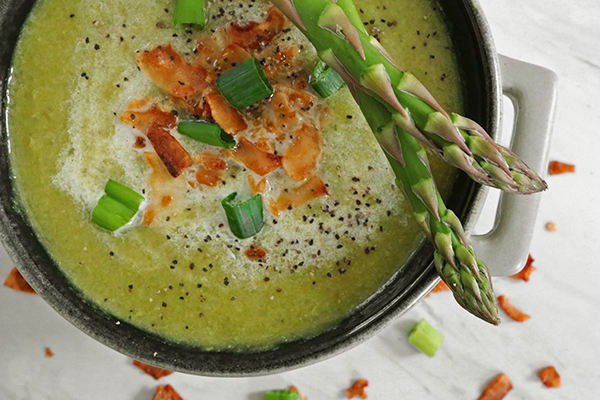 With less than 10 ingredients, you can make a vegan cream of asparagus soup that’s perfect for the spring season. Trim the woody ends off the asparagus. Cut in to 1-inch pieces. 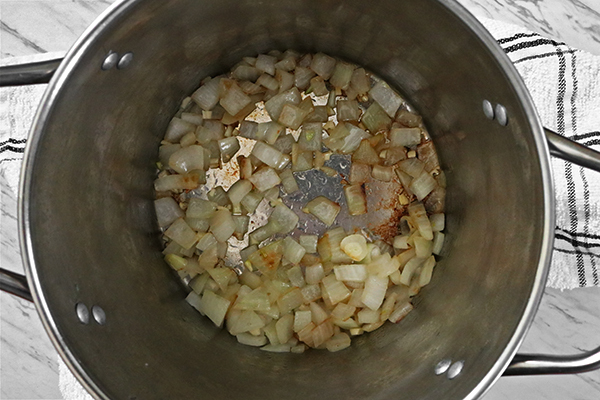 In a large pot over low-medium heat, cook the onions in olive oil for 5 to 7 minutes, or until clear. Add the garlic and cook for another 1 to 2 minutes. Add the asparagus and potatoes. Cook for 5 to 7 minutes. Add the broth, lemon juice, salt, and pepper. Bring to a boil, then reduce to a simmer. Cook for 25 to 30 minutes or until the vegetables are tender. Let cool slightly. Puree in a high-powered blender or food processor. Serve with vegan bacon, dairy-free Parmesan, or scallions. Have you ever made vegan cream soup? Tell us about your favorite recipe in the comments below!